For our 10th anniversary issue, we conducted our biggest Mega Test yet. 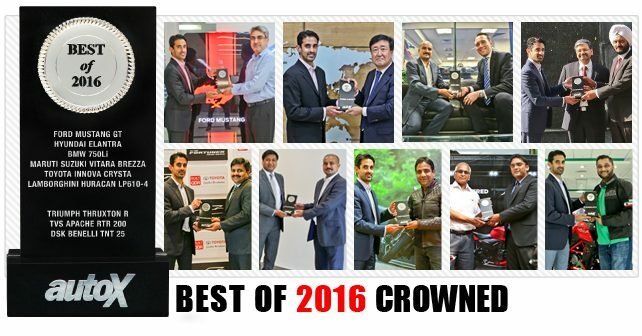 50 of the hottest new launches of 2016 fought valiantly at the Buddh International Circuit in an attempt to be crowned the ‘Best of 2016.’ This honour was reserved for just 6 four-wheelers and 3 two-wheelers – we added a special ‘Performance Car of the Year’ award this year as well. Needless to say, these deserving machines are as diverse as they are exceptional. The ‘Best of 2016’ are the Ford Mustang, Hyundai Elantra, BMW 750Li, Maruti Suzuki Vitara Brezza, Toyota Innova Crysta and Lamborghini Huracan LP610-4 – which scorched the track with our best lap ever of 2:12.8 – as well as the Triumph Thruxton R, TVS Apache and DSK Benelli TNT 25.